Bethesda Hospital West is an all-new, world-class, not-for-profit, community hospital located at the northeast corner of Boynton Beach Boulevard and US-441. As part of Bethesda Health, this new hospital facility provides comprehensive inpatient and outpatient medical services, with state-of-the-art technology that incorporates environmentally sound practices. Bethesda Hospital West has been designated as the Robert B. Hill Campus in honor of the former CEO who served for over 40 years at Bethesda. 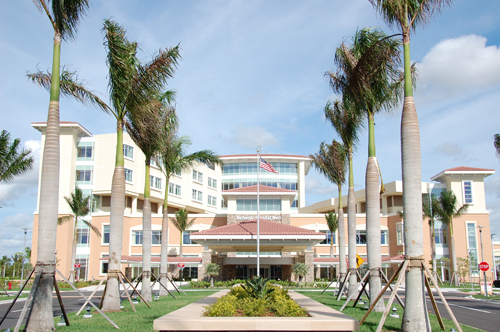 The dream to build a hospital to serve the western communities of South Palm Beach County began with the opening of Bethesda Health City in 1996. This outpatient medical mall in west Boynton Beach saw tremendous growth, and Bethesda Health recognized that the western communities needed vital healthcare services, ranging from emergency care to inpatient medical services. Special features of Bethesda Hospital West include: a completely electronic medical records system that enables physicians receive test results for their patients in real time via their smart phones or office computers and enables the hospital to be “paper lite.” It will also ensure that patients receive optimal care so that they can recover in a timely manner. Opened in 2015, the Eloise Kimmelman Foundation Center for Interventional Treatment and Research at Bethesda Hospital West is a state-of-the-art surgical suite that offers minimally invasive procedures for endovascular and cardiac care. It is a unique hybrid operating room capable of diagnostic cardiac catheterizations, endovascular procedures and interventional radiology procedures. As an additional benefit, patients can order their meals via room service. Patients are able to order from a prescribed menu when they are ready to eat, adding to the hotel-like atmosphere. The hospital also has three separate elevator banks: one designated for patients; one designated for visitors and a third for supplies and equipment, helping to ensure that patients are more comfortable as they travel through the hospital. The Bethesda Hospital West site is part of the former Amestoy Farms. Nancy and Martin Amestoy were one of the pioneering farm families in the Agricultural Reserve who purchased the land in 1951 and farmed here for more than 50 years. Bethesda is proud to recognize the Amestoys by naming the Bethesda Hospital West main entrance road in honor of Nancy Amestoy.